3DS owners, make sure your wireless switch is on: Nintendo just sent out a new puzzle panel for StreetPass Puzzle Swap. The new picture of Mario Tennis Open is a 40-piece puzzle, which should last you a fair old while. We haven't heard of any other pictures coming through yet, but if you get a different image then be sure to let us know in the comments. I wish third parties could also offer hats and panels that would be so awesome. I wouldn't mind if i have to pay for them either. Awesome!!!!! I was hoping that we would get a puzzle since I just got all of the hats and am now focusing on puzzles. Just got my new piece. shame it wasn`t a pink one though. by the way, can anybody tell me how many panels there are in total so far? so far i have 16 including the new one. I just want my Mii to sport Ryu's headband, megaman's helmet, Dante's white hair, and one of those red things moogles have. sweet!! I can't wait to get them!! I really wish more people would carry around their 3DS so I could get more actual Street Passes. At the rate we get new puzzles I'll never complete them. 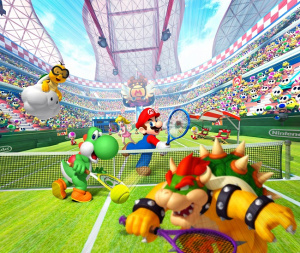 @dizzy_boy Im pretty sure there are 16 panels in total unless they are sending out more than just mario tennis. @Victoria - Move to Newcastle! That worked for me. Every time I go to the city or the Metro(id) Centre, I always get 2 or 3 hits, usually people with pink pieces that I don't have. I have 16, but I haven't gotten Mario Tennis yet, i think. I've been getting a bit more street passes as of late but I never seem to get any new puzzle pieces! PLAY THE DARN GAME PEOPLE!! Currently right now I have 16 Puzzle Panels. I had 15 before but with the Mario Tennis Open puzzle piece I just got today via SpotPass, it's now 16. I swear, these Puzzle Panels are one of the best ideas they came up with for the 3DS's StreetPass feature. There go next month's play coins (sorry KI: Uprising). Currently, I have 13 blue pieces missing across half a dozen panels. With the addition of this new panel, (I'm going to need to become a marathon runner ). I hope they do more panels for upcoming games! Animal Crossing please! You can, you just need to change the date everytime that you get 10.
sigh Now I have to deal with the trouble of getting more pink pieces for a new panel. this bites I wanted the Fire Emblem puzzle, like Japan got so that US and Europe had SOME hope that would arrive here as well. I never get the pieces/street pass tags anyway, no one near me owns a 3ds. Always like having to help spend my coins. Great to see more panels. Need to open this up to third parties as well, along with more swapnote templates. I can hardly street pass anyone. No one really takes there 3DS with them. @Victoria I agree with you 100%. I've only street passed 3 other 3DS users. Ever since that, I've been having no luck when I go somewhere.